Vinyl format is a white label 12" in a standard paper innersleeve. there is a sticker on one label and also in the centre/top of the sleeve . Very nice, dj-friendly cut. 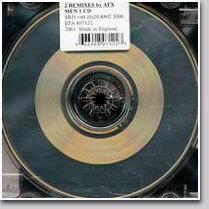 MEN 1 CD, SRD 44 (0) 20 8802 3000, EFA 807122, 2001 Made in England". MEN records is a sub label of Rephlex records.